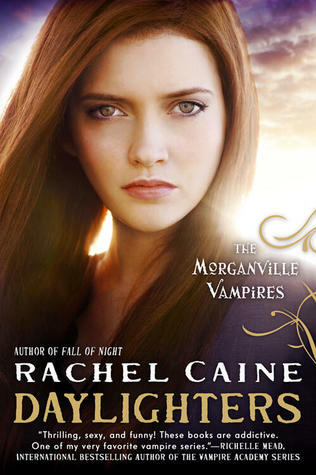 As Rachel Caine pointed out herself, it’s bittersweet to say goodbye to Morganville, but at the same time, the goodbye has come not a second too soon. The Morganville well has been drained of its very last drop of entertainment, left with nothing but sweet memories to give. While I was never the biggest Morganville fan out there, I’ve been following the series happily and eagerly from its very beginnings. We’ve had some good times and we’ve had some bad, but as with all things that belong to the past, in time, only the good will be remembered. In the 15th and final installment of Morganville Vampires, the town faces a human enemy. The Daylight Foundation has arrived, imprisoned the vampires and turned most of the human residents firmly against their former rulers. But although their cause seems reasonable at first glance, protecting humans from vampires isn’t their ultimate goal, and Claire, Shane and Eve have to find a way to fight them while Michael is locked up with his kind. Claire struggles with the morality of her decision to side with vampires, especially since the citizens of Morganville seem safe and content for the very first time. If forced to use a single word to describe Daylighters, ‘boring’ would probably be my first choice. I saw this book mostly as something I needed to suffer through in order to get a satisfactory ending for the characters I’ve grown so attached to. The plot itself didn’t offer anything new and it was surprisingly unemotional, with the exception of the ending, of course. My favorite thing about Daylighters was that Caine finally returned to a single point of view. If you’ve read the previous book, you might remember Shane being bitten by a very strange dog. Caine neatly developed that storyline in Daylighters, but then just as neatly swept it under the rug, which gave me the impression that she only introduced it because she didn’t know what else to do to fill the pages. As for the ending, everything that happened has been hinted at several times, so I pretty much expected it, but that didn’t make it any less sweet. I am perfectly happy with how we left the Glass house gang, and everyone important got some sort of closure. Caine left no loose threads. This is perhaps the longest series I stuck with, and I’m not sorry. All things considered, it’s a fairly good one, always entertaining if not exactly original or particularly well written. Wow, I doubt I'll be picking up such a long series...ever. I'm glad that you have no regrets, though, Maja. With a series you've been following for a long time, that's always important. Lovely review, dear! It was kind of a treacle-y ending and I'm still not sure I like how Michael's story was resolved but a decent ending. I'd probably give it three stars, just for old time's sake. I'm so very far behind on this series Maja! I think I'm on book 5, but that was probably 2 years ago, so basically I would really need to start over with book 1. It's a shame this final installment was a tad boring, but I'm glad at least the ending was emotional and will leave you with fond memories of the series overall. Lovely review as always! Aw, sorry to hear this one was overall boring. You're one brave lady to be able to read through 15 books of the same characters, Maja. I don't think I would enjoy this series because how unique can you really be in 15 books? Anyways, it's a shame that this was boring, but at least you thought the characters got what they deserved. 15 books to a series seems exhausting. I stopped reading at book 5 but I never really stopped hoping I'll get to finish this series someday. This is such a disappointing series ender for sure. I mean, it should've been everything BUT boring: action packed? full of emotion? suspense? Not boring for sure. Great review, Maja. Sorry it let you down, though. I have really enjoyed this series too even though I am about 5 books behind on it! I am a little sad the ending wasn't..more. This is definitely the longest series that I've stuck with too. Which surprises me often. I wasn't the biggest fan of the last few installments, so I'm not going into this with anything but low expectations, but I'm glad to hear that everything wraps up in the end. I don't care for the plot at all anymore, but I'm curious about the characters and hope all my favourites will get the endings that I want them to. Great review, Maja! Wow, 15 books is quite a long series and I'm not sure I can commit to something that long! I finished the Sookie series but was tempted to call it quits for a while, and I still have the two most recent books of the House of Night series... Sometimes series go on for too long and simply lose me along the way. But good for you Maja for sticking with this one till the end! it may be difficult to have a long series like that... I'm really impressed mainly if you're not the biggest fan. I confess I didn't even know it was book 15 already. I haven't started it, but I need to try book 1 to see how it is. I haven't read any of this series. :( I do think I would be frustrated with that storyline being dropped... and trust me I would remember a strange dog element. LOL Hm... one day I will start this series... but 15? Oy! I'm hopelessly behind on this series, but I'm glad to know the ending isn't spectacular, otherwise I'd be anxious to catch up like a mad woman. I'm glad you don't regret reading the series though, that gives me enough motivation to keep it on my TBR pile. Wonderful balanced review, Maja! I skimmed just to your rating since I'm behind on the series and don't want to know anything about what happens. I'm sad to see the low rating, but I'm thinking maybe this is a series that should have been wrapped up a bit sooner? That is quiet a shame that the last book in the series ended up being boring, but it seems like the author should have ended it sooner rather then later. Man, fifteen books?? That's CRAZY. It's no wonder really that you found this to be boring. I imagine very few authors are able to draw out a story and keep it interesting and exciting over the course of fifteen books. But hey, I'm impressed at least that you don't regret sticking with the series until the end! I really don't have time to squeeze in a fifteen book series, but I'm glad at least you got some enjoyment out of it!